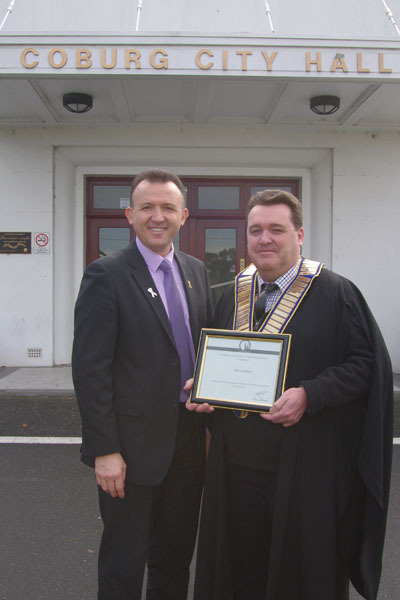 Recently I had the privilege to be Mayor For A Day of the City of Moreland. My written submission for the competition was one of a hundred that Councillor Oscar Yildiz, Mayor of Moreland, considered, and to my delight, I was one of seven selected to see what our mayor does during a working day. On Thursday 27 June, 2013 at 9:00am, I was warmly greeted in the council foyer by Oscar and his Executive Assistant Monica Bucciarelli, and they both kindly introduced me to staff members at the council. At 10:30am, Oscar and I were photographed outside the Coburg Town Hall where I had the opportunity to wear the council robes and chains. At 11:30am, Oscar and I arrived at the former Glenroy Primary School site in Wheatsheaf Road for the artwork launch Homeward Bound. The artworks launched were created by Leith Walton and it was great to meet and chat with him. Leith and his family were thrilled to be supported by the council for the project. 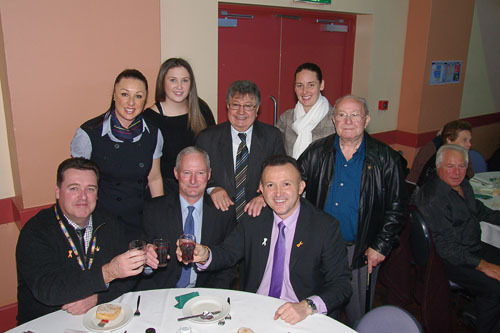 From 12:30-1:30pm Oscar, myself, Monica and Moreland City Council CEO Peter Brown enjoyed lunch with the Italian Pensioners Group of Merlynston at the Coburg Town Hall, where I estimate there were 350 in attendance. The three-course meal with red wine was excellent and we enjoyed the company of those who attended. At 1:30pm I had the opportunity to see Oscar carry out his duties as a JP and witness the signing of a document. I had the opportunity to share some time Clr Yildiz and his staff where we chatted about various operations that the council has to perform as part of local governance. 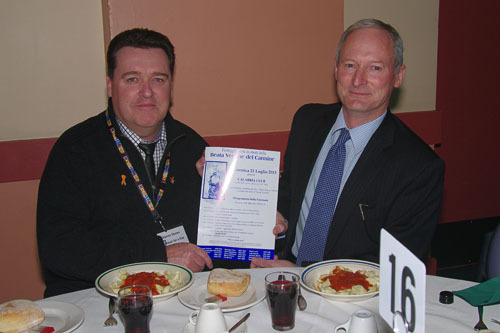 During the morning and later at lunch, Chief Executive Officer Peter Brown explained to me various aspects of projects that the council is involved with, both at the local level and on a broader scale in partnership with neighbouring councils. Peter talked about projects like the grade separation at the Coburg and Glenroy Railway Stations, and how they are requiring substantial planning due to site challenges, budgetary considerations and future growth in the area. Between 3:00-4:00pm, Nalika Peiris, Unit Manager - Community Development and Social Policy - and I walked around Coburg to see and discuss some community development initiatives that the Moreland Council has been involved with. We visited Pepper Tree Place, which is a volunteer-driven, local garden initiative at UnitingCare's Kildonan community hub on the corner of Sydney Road and Urquhart Street. We also visited the Victoria Mall redevelopment between Sydney Road and Waterfield Road, which was buzzing with people enjoying coffee and each others company. Nalika and I got into the swing of things and shared a hot chocolate together. 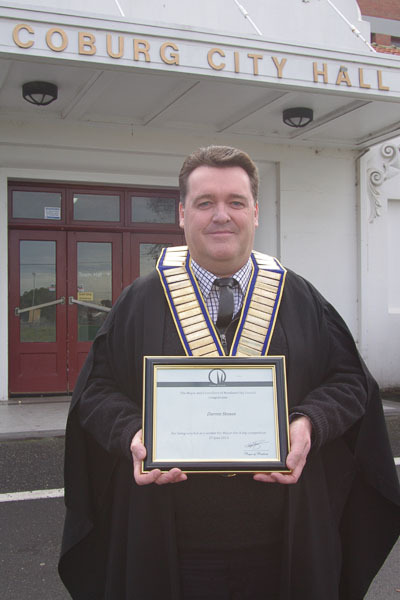 As part of being Mayor For A Day, I received a framed certificate, a writing compendium, business card holder, pen, 8GB USB stick containing photos of the day, the council's 2012 Annual Report, and the latest edition of Inside Moreland. I thoroughly enjoyed the experience and feel it was a valuable opportunity to learn about how the Moreland City Council is positively contributing to our community. Given I'm currently studying a Diploma of Community Services Work and Diploma of Community Development at the Kangan Institute Broadmeadows Campus, I feel fortunate to have been chosen for this once-in-a-lifetime opportunity. I extend my gratitude to Councillor Oscar Yildiz, Mayor of Moreland, and to the Moreland City Council staff for a memorable day. 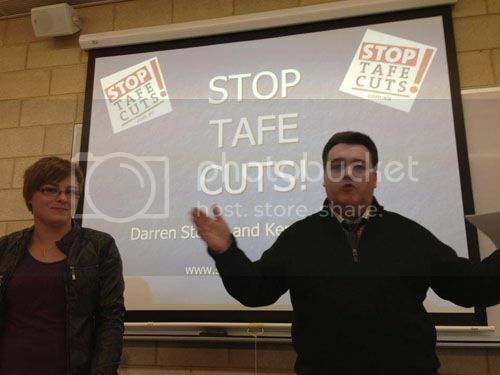 Monday June 3, 2013 was National TAFE Day - STOP TAFE CUTS! It was a day of national protest and an opportunity for people to express their views about the funding cuts to the TAFE sector in Australia. Here is the full transcript of the speech I delivered during the Legal Structures class, which is part of the Diploma of Community Services Work at the Kangan Institute Broadmeadows campus. Hi everyone. I'd like to welcome you all to the Kangan Institute Broadmeadows campus. I'd like to share some thoughts with you about the funding cuts that are happening to TAFE and how it can negatively impact on how people learn the skills they need for the workplace. State government funding cuts to TAFE is now having a negative impact on how students learn in Australia. As someone who has done much learning by correspondence, I believe that attending classes on campus at TAFE is a far better option. I'd like to relate a little of my recent personal journey. In August 2009 I experienced a mental breakdown in the Centrelink Office in Broadmeadows. Many have said to me that Centrelink can have that affect on people, and I can clearly see why. It's not fun being treated like a number by some people who seemingly lack empathy. Having experienced depression and anxiety, and now at the point of a full recovery, I know how important tertiary education is in an environment where people can connect and become friends. Last year I decided to enrol in the Diploma of Community Services Work and Diploma of Community Development at the Kangan Institute because I wanted to change my career direction and use my lived experience to the betterment of others. Like many of you here, I have aspirations for my future, and I'm sure you are all mindful of gaining the skills that employers will be seeking in conscientious job seekers. Let's not beat around the bush here. Cutting funding to TAFE does not make economic sense. For starters, studying in isolation can lead to a complete loss of motivation and willingness to learn. There's definite potential for people to slide into depression and withdraw from society. They can become unemployed and disconnected from society very quickly. I know what I'm talking about because that's exactly what happened to me. When studying via correspondence in isolation, my mental health deteriorated and it also impacted on my family. Fortunately for me, they stuck by me. I know for many others, they experience being pushed away due to stigma and shame. Folks, TAFE provides a fantastic opportunity for people to gain the skills they need for the workplace. TAFE is a widely-respected institution where people can develop connections and expand their network whereby potentially leading to employment. For me personally, I've been fortunate to connect with a younger student peer and I've been assisting her with her studies. A mentoring relationship has developed between Kerryn Hardstaff and I to a point where mutual respect is evident and we are both gaining from the experience. This is exactly the type of scenario that would play out in a real work environment, and here we are facilitating our own mentoring relationship at the Kangan Institute. Our mentoring relationship is proving to be beneficial for both of us. Kerryn and I are supporting each other through our studies in a professional manner, and I believe the Kangan Institute has provided us with a valued opportunity. In years to come, Kerryn and I will reflect at our joint learning experience and recall how the process unfolded. I believe it will hold us both in good stead in the workplace because we will both know how a mentoring relationship works effectively. Sometimes Kerryn and I share a cuppa in the cafeteria before going to class. We chat about stuff and support each other in a manner you'd expect of conscientious community services workers. We are just part of the whole face of TAFE in Australia. We're studying here at the Kangan Institute to gain the skills we both need so we can go on to assist people in our community. We're not simply here to kill time − we are here to learn from highly-experienced industry-skilled trainers who have our interests at heart. In my opinion, studying in isolation is not good for people's mental health. Yes, I'm sure some would disagree with that statement, however the learning Kerryn and I are experiencing clearly demonstrates what can be achieved in a healthy learning environment. In closing, I would like to leave you with this. Speak up for yourself, so you can go on to speak up for others. As future workers and possibly team leaders and managers, the skills you achieve during your studies at TAFE will form the foundation you need in the workplace. Thanks for your attention and enjoy your studies at Kangan.